Oct - 12 | Posted by: celebrityabout | no comments. Step Back in Time: at request, a collection of pictures featuring bubbly supermodel Karlie Kloss in 2013 at age 20-21. Aug - 11 | Posted by: celebrityabout | no comments. Real Housewives of Atlanta’s Kim Zolciak-Biermann and her daughter, Brielle, 19, were spotted at LAX on Tuesday sporting over-inflated lips. Like mother, like daughter, right? The 38-year-old reality star was in Los Angeles to work on the launch of her new skincare line, Kashmere Kollection. While she was there, she paid a visit to her plastic surgeon, Dr. Garo Kassabian. Being the social media monster that she is, Kim documented the trip on Snapchat. Dr. Kassabian is quite the in-demand plastic surgeon in Beverly Hills. Kim could only get in to see him at 9 p.m. on Friday night. As she states numerous times in the video, it’s “only the best, baby” for her. The Daily Mail posted a video of Kim’s L.A. Snapchat adventure and it’s kind of refreshing to see that her videos are just as dull as those from someone not in the public eye. Aug - 01 | Posted by: celebrityabout | no comments. Katy Perry is one of the most successful female artists on the planet. She’s managed to stay relevant ever since the release of her hit single, “I Kissed A Girl” way back in 2008. Her parents, Keith and Mary Hudson are deeply religious and recently lifted the lid on how they really felt about their daughter. They revealed crazy information about the family across two packed services at the Church of Grace in Yorba Linda, California on July 17 and 18. It isn’t news that the both Keith and Mary have been embarrassed by their daughter’s past. You only need to look at some of her music videos to find out why. They even chimed in on her feud with Taylor Swift. “Don’t judge her, pray for her,” they implored. Could this mean that the singer’s new material will be less racy than past efforts? Keith noted that he recently spoke to Perry and even talked about the lyrics of the track. It all sounds pretty bizarre. At least we know that they like the new song more than her first big hit. Keith took things one step further and commented on his days in the 1960s, taking drugs. Did anyone expect anything like this to come out? It came pretty much out of the left field. Basically, they wanted to let us know that there was time they were ashamed of their daughter, but not now. Jul - 15 | Posted by: celebrityabout | no comments. At least 75 people were killed late when a man driving a large truck drove into a large crowd in Nice that had gathered to celebrate Bastille Day. According to The Associated Press, via a witness who was on hand for the heinous act, a driver plowed directly into a throng of citizens prior to getting out of the vehicle with a gun, firing away in all directions. The culprit was shot to death, authorities have confirmed. At least 100 people were injured in the slaughter, the same authorities have also said. Another individual who was present told Fox News that cops did, indeed, shoot and kill the gunman; his name has not yet been released. Various photos, meanwhile, depict police trucks riddled with bullets, a result of a gunfight between the suspect and police. 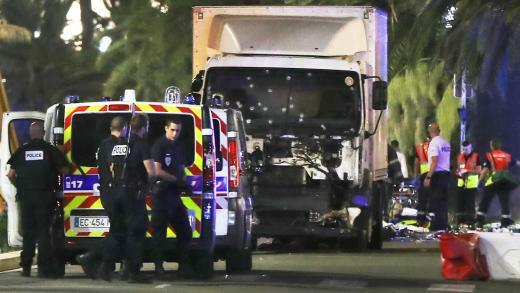 CNN reports that the tractor-trailer drove for two kilometers along the pavement of the Boulevard des Anglais, the main street in Nice, taking out pedestrians along the way. Regional President Christian Estrosi says police discovered firearms, explosives and grenades in the truck after the shooter was taken out. “This is the worst tragedy in the history of Nice with more than 70 victims already reported,” Estrosi Tweeted this evening. Bastille Day marks the storming of the Bastille in 1789. It is a bank holiday in France, with restaurants and hotels especially crowded with revelers. We’ll update this sad story as more news breaks. Our hearts go out to the families and loved ones of the victims. Joey Chestnut has done it, people. The professional eater known as “Jaws” recaptured the Mustard Yellow International Belt on Monday, setting a world record while coming out on top of the Nathan's Hot Dog Eating Contest. After losing out last year in this same contest to Matt "The Megatoad" Stonie, Chestnut defeated Stonie on July Fourth by downing 70 hot dogs. That marks the most hot dogs ever consumed by a human being in that amount of time. Chestnut had held the previous mark of 69, setting the figure in 2013. Contest officials said Chestnut also set a record last month when he ate 73 1/2 hot dogs and buns during a qualifying event, but this is the confirmed number that will go on record. As he held the mustard-colored belt after his victory on Monday afternoon, Chestnut said Stonie had "woke up the sleeping giant" when he upset him last year. He simply would not allow that to happen again. "Last year was rough," Chestnut told the crowd. "This year was the best ever." Stonie – who hails from the same California city as Chestnut – said there were "no excuses" for his loss. He said Chestnut did an amazing job.